This slim volume was first published in 1989, by Elm Tree Books in Great Britain, and by OUP in India in 1999. It is tiny as books go, but was a seminal work in terms of the insights it revealed. Valmik Thapar is probably the most well-known tiger conservationist there is. He is not a trained scientist or field biologist, but in this book Thapar traced the development of the litters of three tigresses in Ranthambore – Laxmi, Noon and Nalghati – along with his mentor, the legendary Fateh Singh Rathore. In the March of ’86, the tigress Laxmi was sighted with a pair of month-old cubs, fathered by a tiger called the Bakaula male. Shortly after, Rathore observed the Nalghati tigress with a pair of cubs a month older than Laxmi’s, these fathered by a male called Kublai. A month or so later in May, another tigress Noon was seen with a newly born litter, this too fathered by Kublai. Sensing the unique opportunity offered by having on hand three tigresses with cubs, Thapar and Rathore closely followed the triumphs and travails of the three litters over the next couple of years, until the cubs reached adulthood. This book is the fruit of those efforts. A good part of the book deals with the question of the tiger’s family ties. It was traditionally believed that male tigers indulge in routine infanticide, killing off any cubs they encountered. In the April of ‘86, Thapar was stunned to find Kublai with the Nalghati tigress’ cubs, together soaking the summer heat away in a pool. This behavior was presently confirmed with the other litters. Thapar then postulated that the resident male interacts and develops bonds with the litters of the tigresses in his range. He also speculated that infanticide may occur when a male takes over the territory of another and proceeds to eliminate any litters sired by his predecessor to bring the tigress into oestrus. This is behavior observed in monkeys and lions, and Thapar surmised that it was probably applicable to tigers too. A male tiger’s beat may encompass the beat of more than one female and being essentially solitary, the male roves over his range ceaselessly. On occasion, this brings him in contact with the resident females and their litters, and he consorts with the family until it is time to move on again. Further, Thapar found that the male partook of kills made by the tigress, along with the cubs, and allowed the latter to partake of kills made by him whilst in contact. This brought up the remarkable sight of familial feeding in tigers, and Thapar observed upto eight tigers feeding off a single kill. Also, he found (as in the case of Kublai) that the male may consort with more than one tigress and associate with their respective litters. The bonds between the tigress and her litter is strong, and the task of keeping the cubs alive into adulthood while passing on essential life skills was a huge order, as Thapar discovered. He recollected watching the tigress Padmini in ’77, maiming a tethered bait buffalo and leaving the cubs to attempt bringing it down. He also discovered her regulating the feeding to ensure all the cubs got to eat. As the three tigress’ cubs got older, they began to actively help with the hunt, taking up positions to drive prey towards the tigress. And thus you have the phenomenon of co-ordinated group hunting for at least a brief period in the tiger’s life. In Thapar’s words, “if undisturbed and well managed, tigers can, as families, form temporary groupings in order to hunt and share food”. At about sixteen months of age the process of detachment started, though Thapar surmised that the family retained kinship ties for life, recognizing individuals when one of them occasionally happened to run into another. Thapar also made observations around the variation of hunting styles across individuals. In the mid-eighties, a tiger named Genghis Khan pioneered and perfected the hitherto untried technique of charging at sambar across open water in the Gilai Sagar lake,adjacent to the Jogi Mahal guest house. The tigress Noon evidently picked this technique up from him, and preferred bursts of speed over open land while in contrast, Laxmi preferred stalking from thick cover and with shorter bursts. Thapar dramatically describes an incident that occurred in the February of 1987, terming it his “most exciting time ever with tigers”. The narration fills three pages of tiny italicized text. Noon attacked a massive sambar stag that valiantly resisted until the tigress gave up, exhausted. The stag died of its wounds a few weeks later. Thapar describes this and other dramatic first-person encounters in italicized interludes with usage of the present tense. And the ploy works rather well, making taut what might otherwise have been a bland account. There is quite a bit of discussion around the threats tigers and their habitats face, from poaching or other human incursions, and Thapar outlines some prescriptive points to address the menace. I should add that twenty colour photographs buttress some of the points made about tiger behavior. In summation, while this may not be a masterpiece you’ll remember forever, it is certainly a quick, insightful, absorbing (and inexpensive) read for anyone who is a tiger lover. I’ll probably do a review of Karanth’s tiger book next and some comparison will be inevitable. 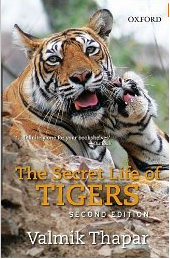 This entry was posted in Book reviews and tagged Book reviews, India, Tiger, valmik thapar, wildlife. Nice summarisation of the book’s content, gives a gist of what one can look forward to in the book. Thanks for sharing this!